Come Join Instructor Rob Harper and Utah Outdoor Adventure Group as they meet each Saturday through March 31st to explore our beautiful Wasatch Mountains. Whether you are new to this sport or not, Rob will help you have a great time! It is recommended you attend the informal cross country ski class held 30 minutes prior to this outing, so you and Rob can talk and get acquainted with each other before heading out. He will be able to answer any questions you may have and also discuss the days skiing destination. Rob Harper is an avid xc skier and has been an instructor for several years. They join up each Saturday morning at 9am at 6200 South Wasatch Blvd. in Salt Lake City at the Park n Ride (Far South Side). If you don’t see Rob immediately, talk to Sheryl at the UTA Park n Ride, far south end, and tell her that you want to Cross Country Ski. A different snowshoeing destination will be chosen each week (usually within the Wasatch Front area). 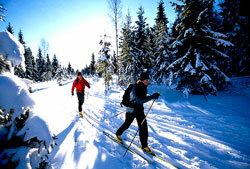 Cross Country Ski’s are required unless stated otherwise and are available for rent if you don’t own any. A 30 minute Refresher Cross country Class is also available at 8:30 am at the same location and all Cross Country Skiing abilities are offered. Come for a few minutes or a few hours. Group ends by 12 noon. Trail may be subject to weather conditions. If necessary, changes may be made the morning of.